This section contains images of posters, pamphlets, and other materials that SSA has made available over the years as part of its various public information campaigns. 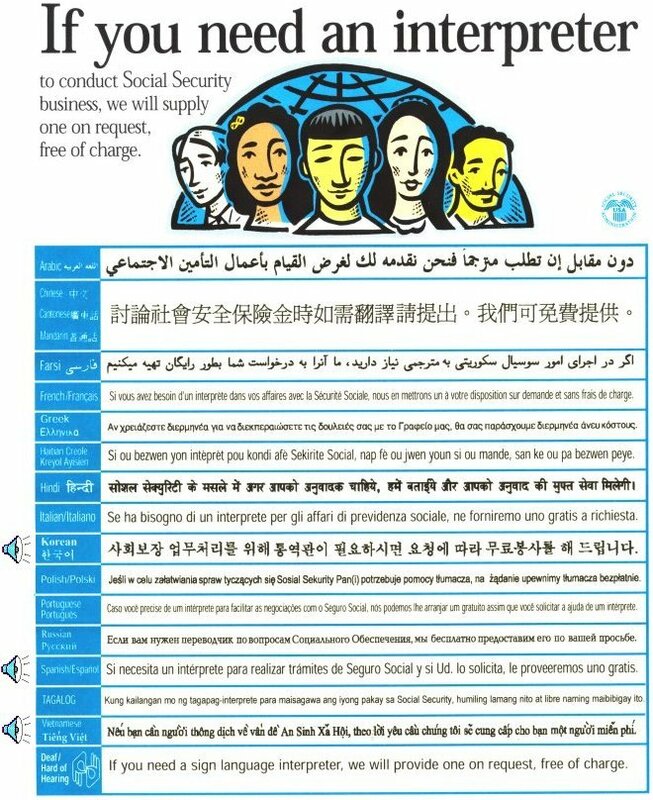 This poster exhorts workers to register (through the Post Office) for a Social Security number in order to participate in the new program. This classic poster was distributed from 11/36-7/37 during the initial issuance of Social Security numbers through U.S. post offices and with the help of labor unions. This poster from the period 1937-1939 announces the fact that during this time Social Security paid lump-sum benefits to the estates of covered workers who died before attaining age 65. This type of benefit was discontinued by the 1939 Social Security Amendments and was replaced by the much more valuable survivors benefits program. SSA History Archives. This poster from the period 1937-1939 explains how wage records are kept for Social Security purposes, as this was an area of public concern in the early days of Social Security. Note also that the forms show the geographical breakdown of the 9-digit account number. This breakdown was done to facilitate bookkeeping procedures as can be seen from the facsimile forms reproduced on the poster. SSA History Archives. 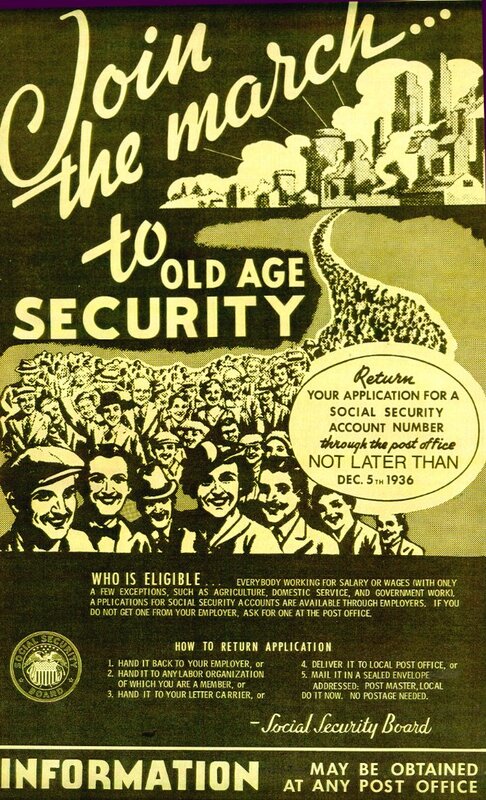 This poster announces the passage of the 1939 Social Security Amendments. These important amendments transformed Social Security from a retirement program for individual workers, into a family income security program--providing retirement, survivors and dependents benefits. 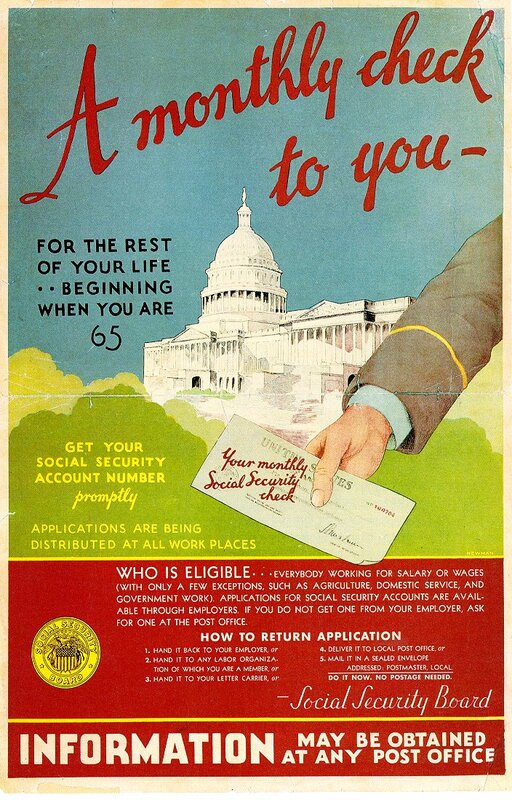 This 1939 poster was part of the Social Security Board's most important early informational campaign--educating the public as to the value of the Social Security card. SSA History Archives. 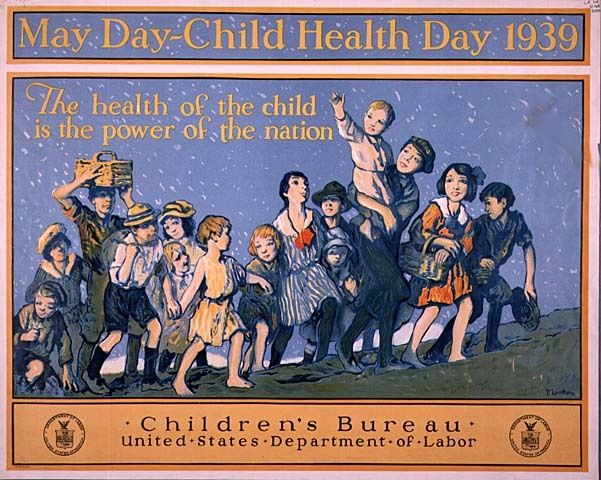 This 1939 poster celebrated the efforts of the Children's Bureau, which is the federal agency responsible for the health and welfare of America's children. From 1946-1962 the Children's Bureau was part of SSA. SSA History Archives. This 1940 poster was part of trio highlighting the programs under the Social Security Act of 1935. This poster is a reminder that the Aid to Dependent Children program (aka AFDC) was an original program under Title IV of the Social Security Act, until it was repealed in 1996 as part of "welfare reform." SSA History Archives. This 1940 poster was part of trio highlighting the programs under the Social Security Act of 1935. This poster is a reminder that aid to the needy blind was provided in the form of grants to the States under Title X of the Social Security Act of 1935. SSA History Archives. This 1940 poster was part of trio highlighting the programs under the Social Security Act of 1935. This poster is a reminder that the nation's first federal unemployment insurance program was also part of the Social Security Act of 1935. SSA History Archives. 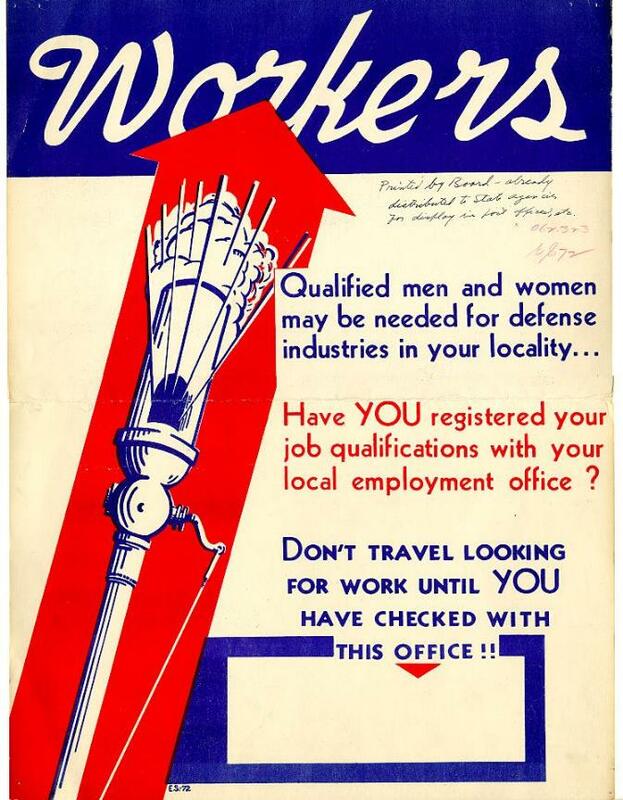 This 1941 poster was a reminder of the mobilization of labor in support of the war effort, and of the fact that the U.S. Employment Service was part of the Social Security Board from July 1939 when it was transferred from the Department of Labor, to August 1949 when it was transferred back to Labor. SSA History Archives. 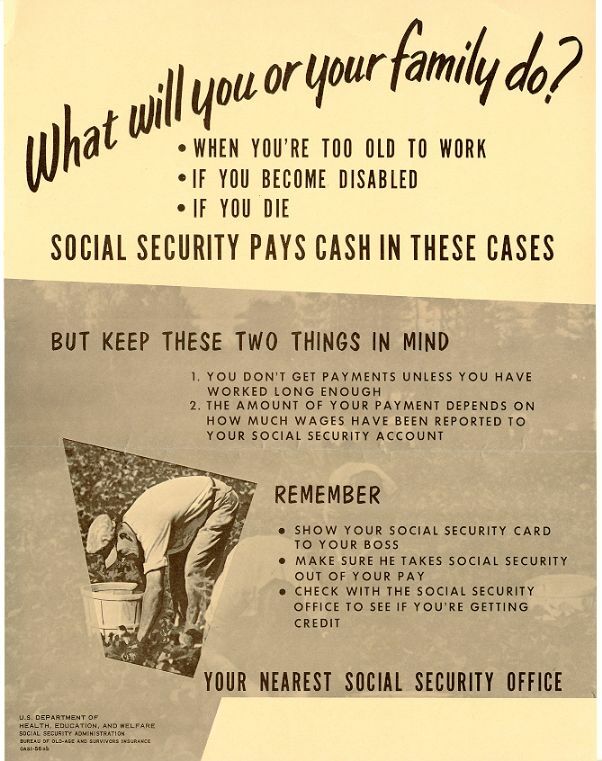 This 1947 poster emphasizes the value of the Social Security card. 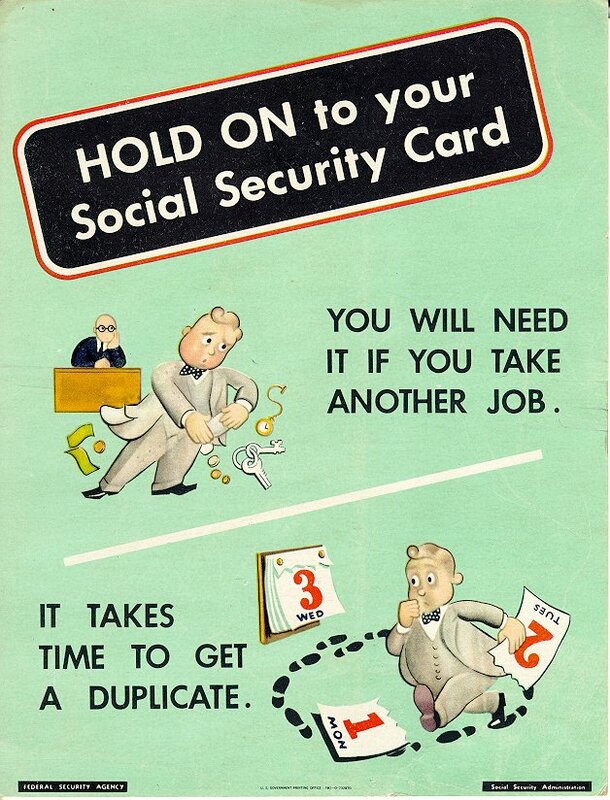 This 1951 poster was part of a continuing campaign to reduce errors in the use of Social Security numbers. This 1954 poster was a reminder of one of the most common pieces of business with Social Security. It also expresses the graphic style of the 1950s. SSA History Archives. This 1968 poster calls attention to the passage of disability benefits in 1956. This 1956 poster asks the fundamental question which underlies the Social Security program. SSA History Archives. 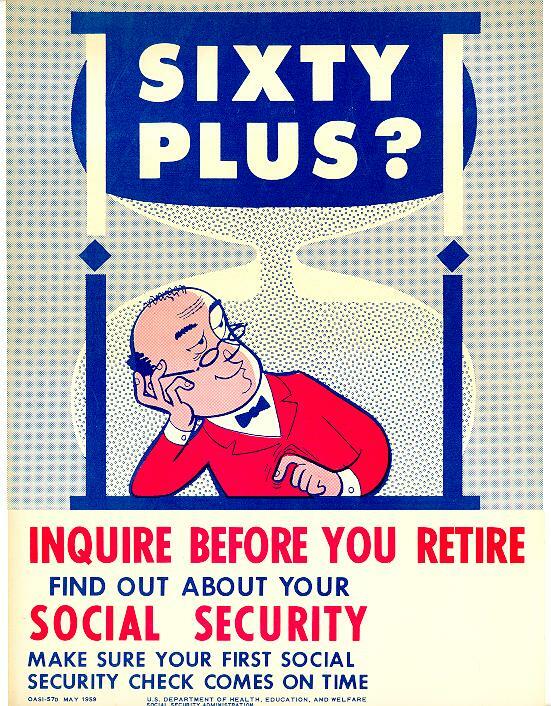 This 1959 poster alludes to the need to plan for retirement. It is interesting to note that at this time early retirement at age 62 was only available to women (since amendments in 1956). This option was not extended to men until passage of the 1961 Amendments . SSA History Archives. 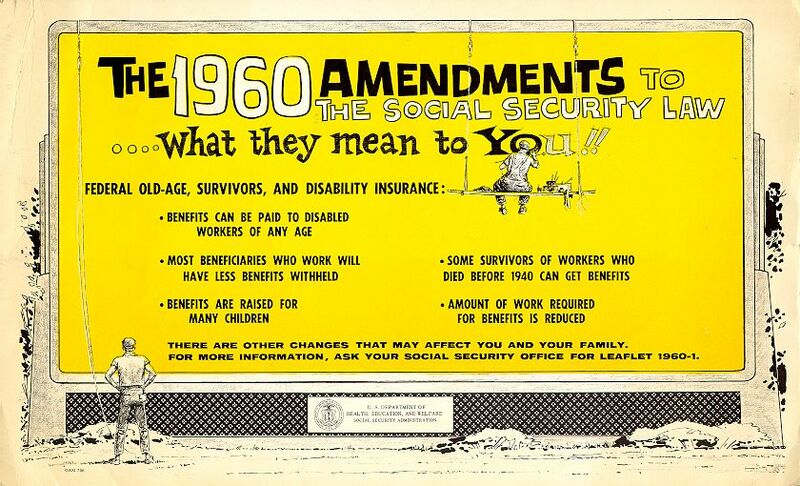 This 1960 poster highlights some of the major provisions of the 1960 Social Security Amendments. SSA History Archives. This 1968 poster informs seniors about the Medicare program that was added to Social Security in 1965 (first benefits payable in 1966). This 1965 poster in Spanish is a reminder that the professional self-employed (such as skilled artisans) are covered by Social Security under amendments passed in 1954. It is also a reminder that SSA's public affairs activities have served the non-English speaking for many decades. SSA History Archives. This 1965 poster in Spanish proclaims that "9 out of 10 persons are covered by Social Security." SSA History Archives. 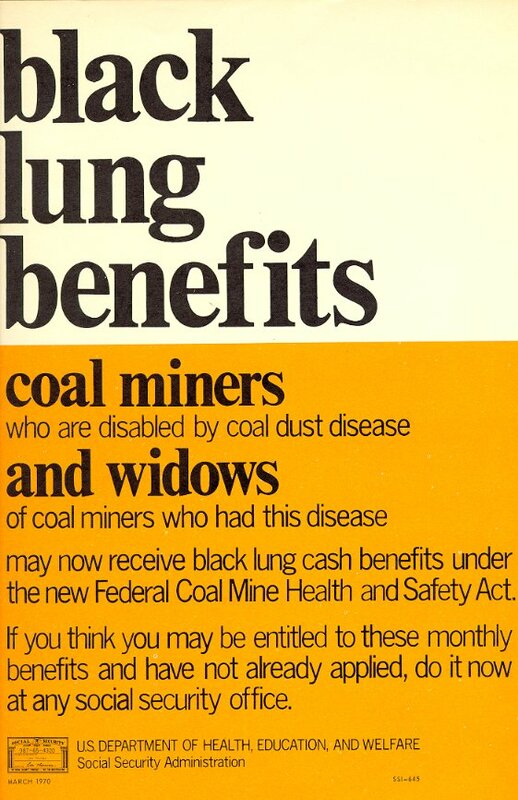 This rather plain 1970 poster announced the availability of Black Lung benefits for disabled coal miners. This 1970 poster powerfully makes the point that Social Security is more than a retirement program for senior citizens. 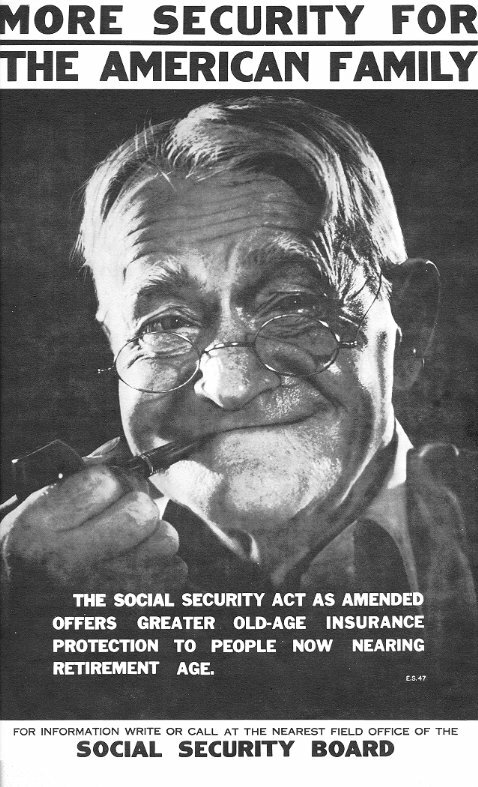 This montage poster was crafted on the occasion of the 45th anniversary of the Social Security Act. This 1980s poster was part of a recruitment effort undertaken by SSA. The young woman is not a model but is an actual Social Security Teleservice employee, in this circa 1989 poster regarding SSA's 800 number service. 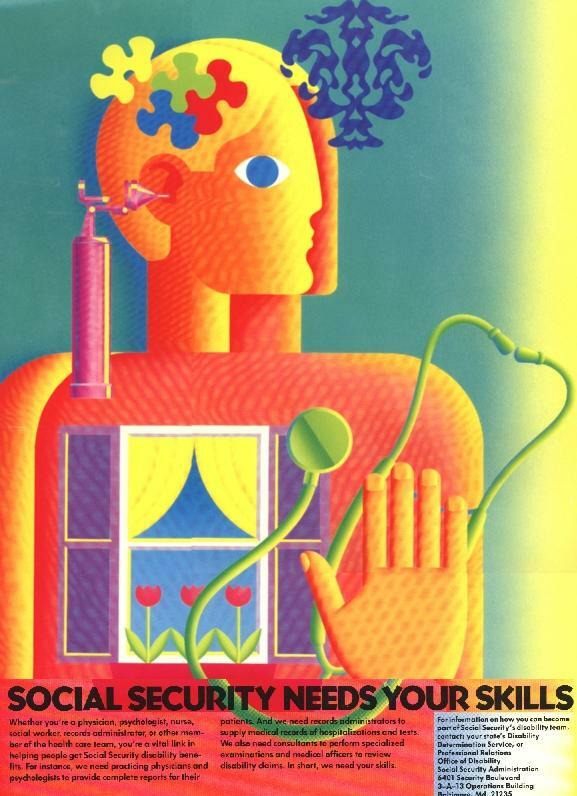 This 1991 poster reminds people that the SSI program has, since 1974, been available to help those in need. 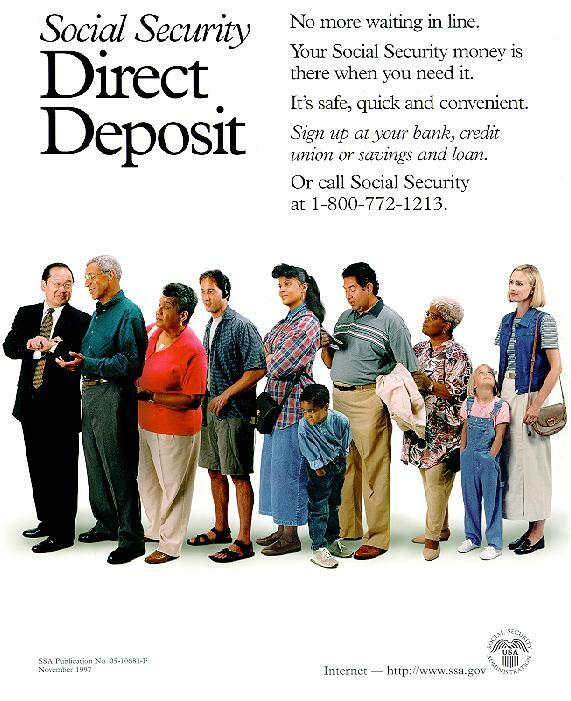 This 1997 poster is a reminder that Social Security provides its services for free. It also marks SSA's publicizing of its Internet address on its posters. SSA History Archives. 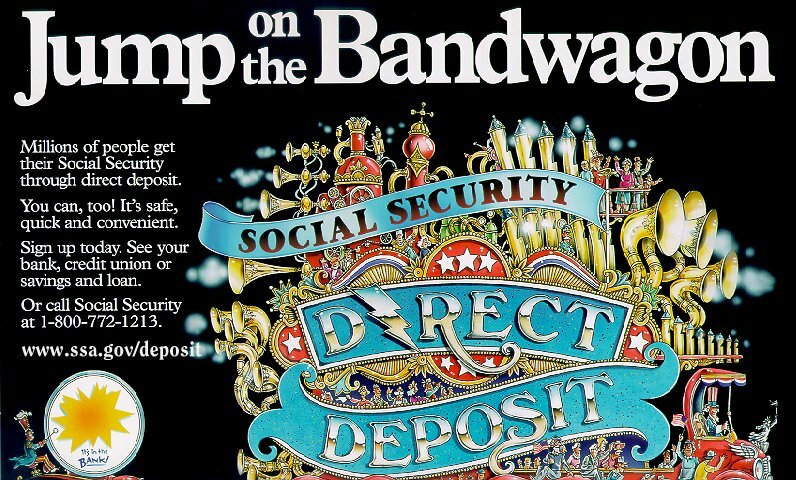 This 1997 poster hits on one of SSA's most persistent themes--the advantages of direct deposit. SSA History Archives. This 1999 poster announces SSA's willingness to provide services to the non-English speaking customer. SSA History Archives.